I have put the E3D hotend together (really easy to do if you follow their instructions) and installed it on the printer. Since then I started to do some test prints. I started with a 20x20x4mm piece. The extruder worked brilliantly however the printer had an issue, the Y axis kept offsetting (see first print above – ignore the waviness, I was impatient and pulled it off the bed while it was still hot). I turned up the power of the Y Axis stepper driver (second print). Same issue, again ignore the blob that was my fault. The Y Axis is quite heavy and I thought that the stepper was still missing steps. The stepper for the extruder has a slightly higher torque so I wanted to swap it for the Y Axis motor. I removed the extruder motor and then started on the Y Axis. As I removed the motor I noticed that the pulley came off too easily. Oops I forgot to put the screw to clamp it to the motors shaft! So what I think was happening was the motor turned but didn’t have the grip on the pulley to move the mass of the bed. I finished the pulley with the nut and bolt and reattached the two motors. 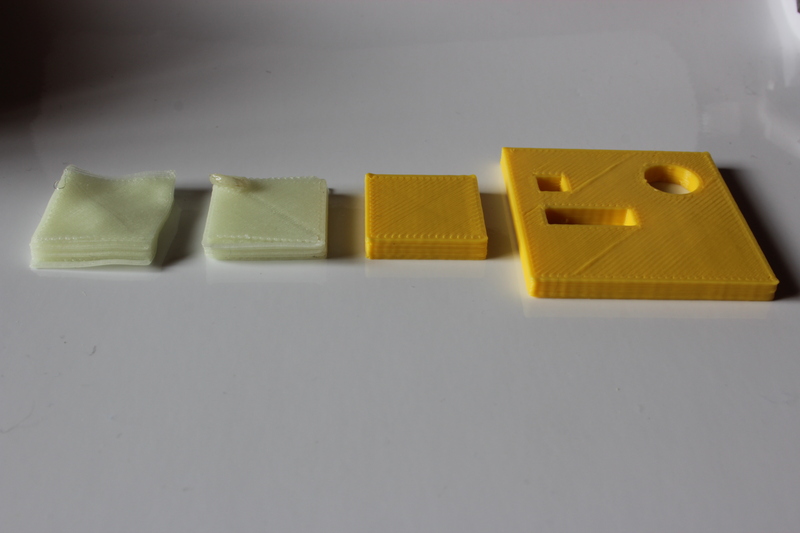 Voilà, it worked correctly as shown in the third and forth prints above. While I was writing this I was printing out a 40mm dome. It finished printing and a similar thing was happening to the X Axis. It isn’t visible on the above prints as they didn’t go high enough for it to manifest. A new pulley was printed on my Huxley as the old one wouldn’t take the captured nut correctly. As you can see above there was some significant slippage although not as severe as the Y Axis had. 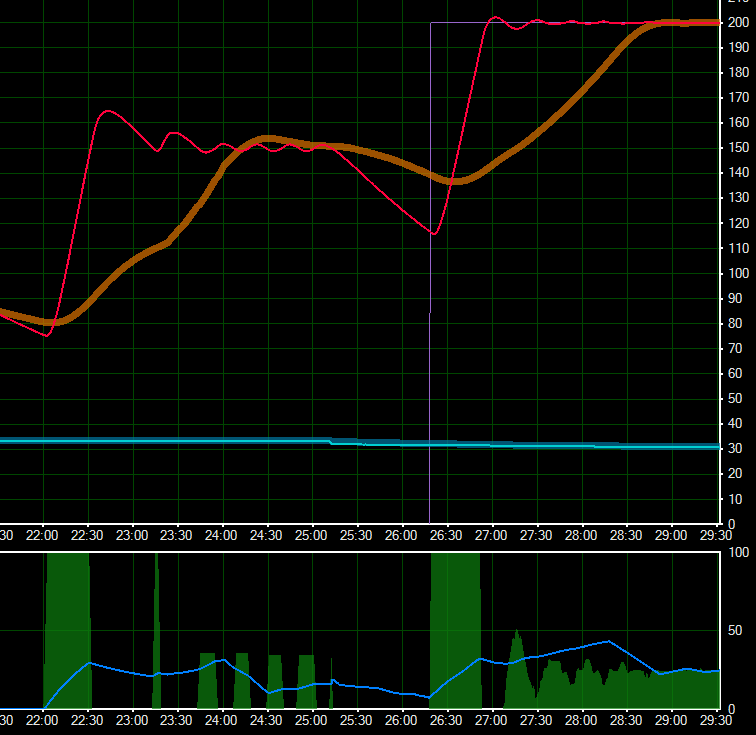 The last thing, which should have been the first, I wanted to do was to do a bit of PID tuning for the hotend. Using the auto PID command M303 in Marling I was able to set the PID to: P 26.84, I 2.48, D 72.57 should anyone be interested in using them as a base for their E3D hotend. 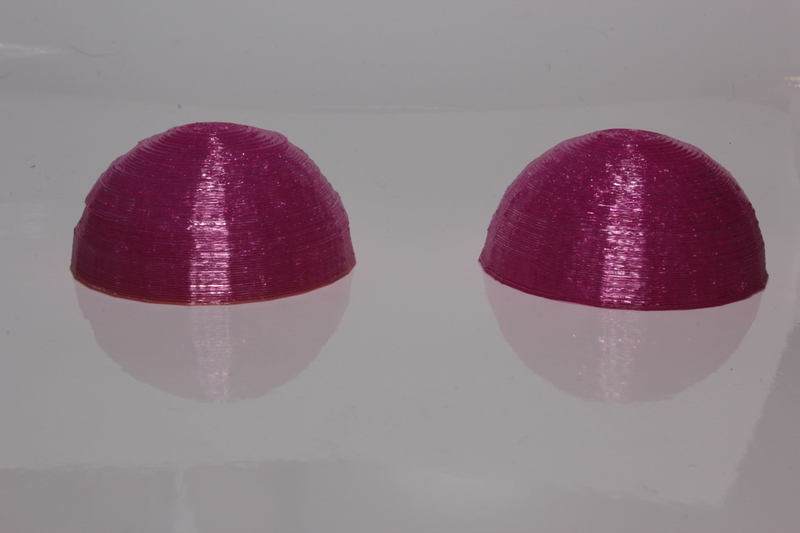 Just in case anyone is wondering the domes were made with Faberdashery’s Aurora UV colour changing filament.